Baltit Fort is located at the top of a natural amphi-theatre formed by terraced slopes, in Karimabad in the northern area of Pakistan. The Fort is the testimony of the Rule of the Mirs for 900 years. The Fort itself was built 700 years ago by the then Mir. Baltit Fort has become a world renowned Historical Heritage of Pakistan and has received several world recognitions. Among them are “PATA Grand Gold Award, Historical Heritage” Category in 1996 and the UNESCO “Award of Excellence” in the Heritage Category in 2005. 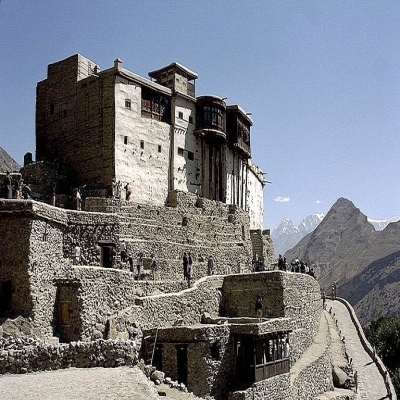 Baltit Fort has attracted many visitors to this Northern Area of Pakistan. The lives of Hunzakuts became more sustainable through the tourism influx due to the Fort. Researchers from all over the world also come to the Baltit Fort Library to learn of the customs of the local and to purchase their handicrafts. The Baltit Fort Library aims to revitalise the community life around the Fort. Other income generating and restoration projects have also been planned to restore community life in the valley. Currently the projects provide additional income to more than 3,000 women, direct employment to over 70 women, while its rehabilitation center provides work therapy to 60 disabled males. The PATA Foundation sincerely recognises and applauds the ongoing development administered by the Baltit Heritage Trust and we are proud to extend our support through our 2008 Grant Programme.